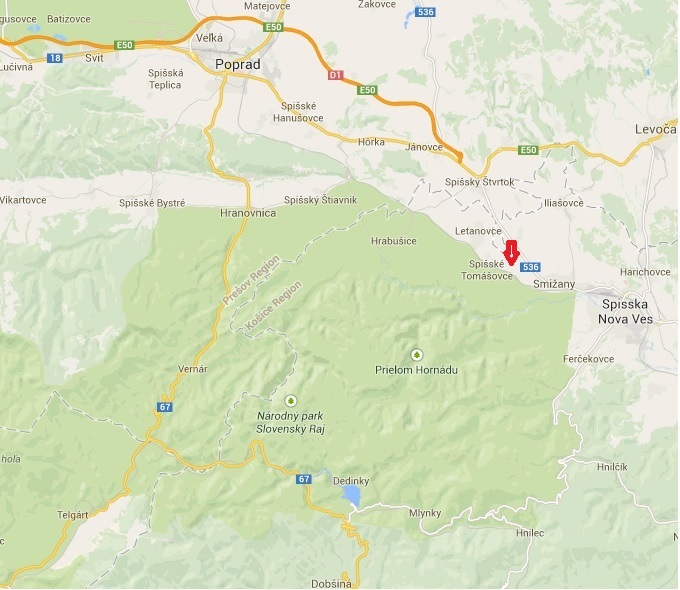 The Slovak paradise stretches south of Poprad. It is a beautiful nature reserve – a wood rich of trees, vegetation, fungas, animals, caves, and much more. Hundreds of well-marked walking trails cover the area. 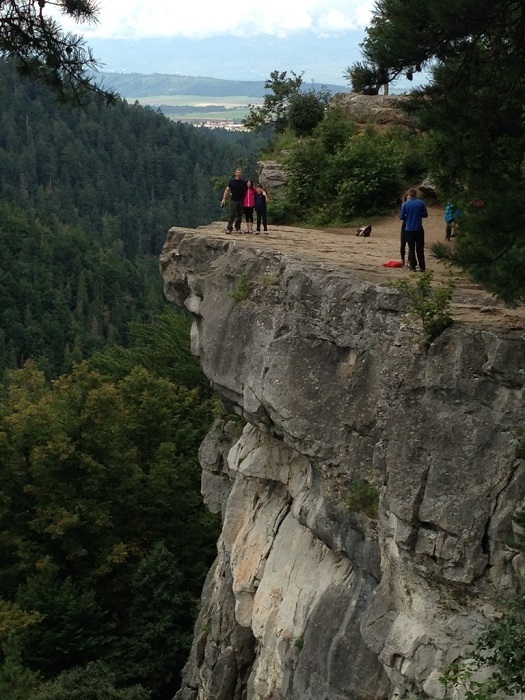 The most popular Slovak paradise hiking trail is Tomasovce cliff (access to it is marked red on the map). The access point to the trils is from the village of Cingov. There is a parking lotsome restaurants and an information center where you can get the trail maps and pay the entree fee to the nature reserve. From there, you can take the marked yellow path of 45 minutes trail in the woods. 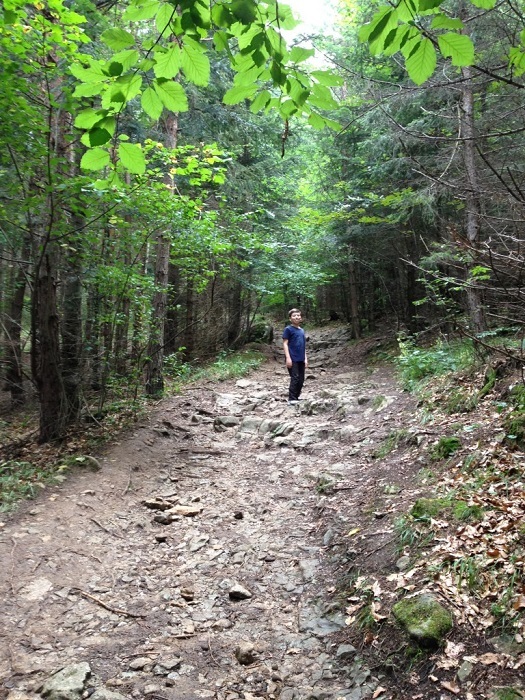 Like everything in Slovakia, plan for some uphill walk. 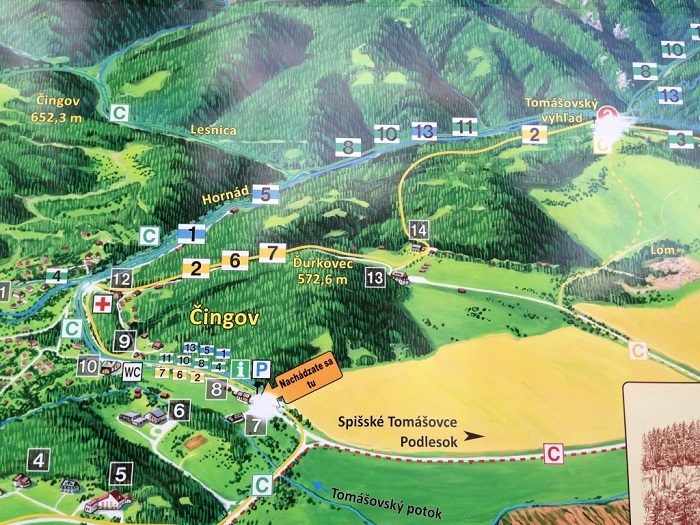 We mis-navigated and did not reach Cingov, insetad, we reached point 13 in the trail (see the map below) and navigated with the app of Slovakia maps (you’ll find more information about the app in my introduction to Slovakia). Only later on we realized taht we walked 15 minutes less. You can do a circular path and return via the dashed yellow path if you don’t want to return the same way you walked. The trail passes via a shaded wood, full of vegetation and sometimes wet. 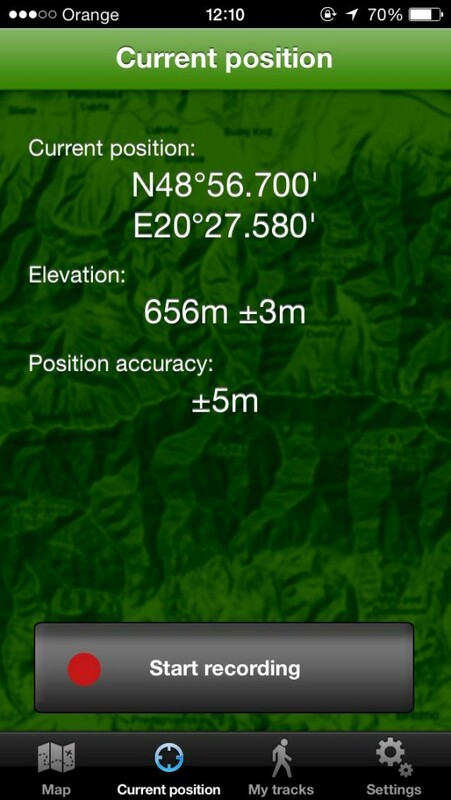 The trail is marked green in the app and is on the mountainside. The elevation difference of the path is 100m, from 550m to 650m). The azure dot marks the location of the cliff (the viewpoint), which is at elevation 650, 140m above the river valley, which makes the scenery stunning! It is also possible to walk along the river (the blue trail), I saw that there are bridges there and it looked nice. Here’s the location according to the app. Elevation 656. 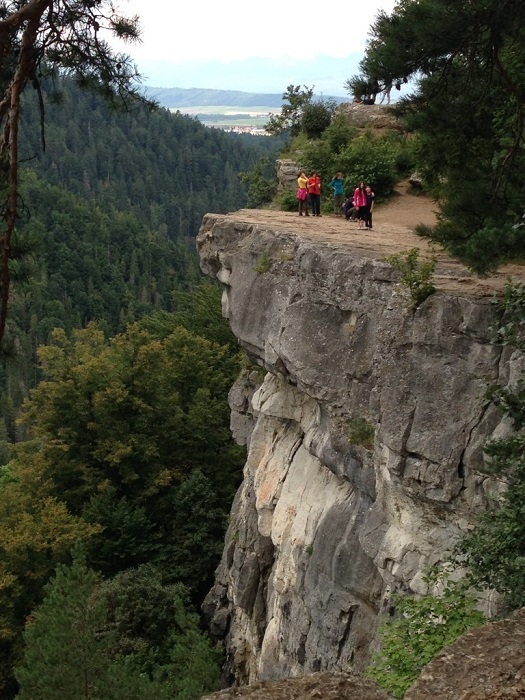 After the walk in the woods you hit the cliff all of a sudden and the view is breathtaking! It is quite scarry to get closer to the edge. The cliff has rings and hooks, people do rappelling there! On the side of the cliff there’s a litle path, which makes it possible to do things that look scarry in the photograph and give mom a little heart attack! 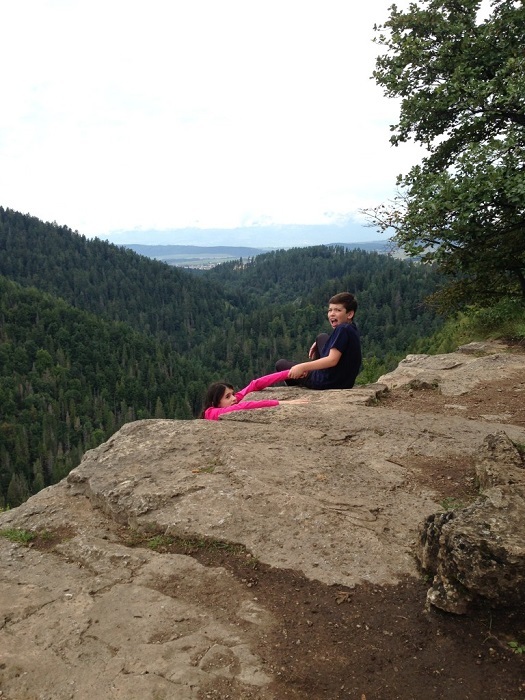 The trail is suitable to families with children and the view is stunning! Don’t miss it if you get to the area! For additional article about Slovakia click the tag: Slovakia.